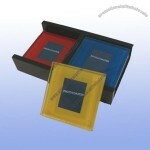 PRECIOUS MEMORIES, DRESS UP ANY DESK, COUNTERTOP OR TABLE SETTING WITH THIS BEAUTIFUL COLOR PHOTO COASTER SET IN COLOR GIFT BOX. 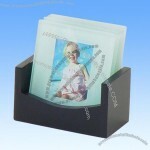 4 GLASS COASTERS AND A WOOD STORAGE RACK FEATURE RUBBERIZED FEET TO PREVENT SURFACE SCRATCHING. 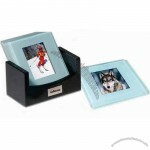 Measurement: 4.75" X 2.75" X 5"
7 1/2" X 4 3/8" X 1 1/8"
Measurement: 7 1/2" X 4 3/8" X 1 1/8"
Custom-made Photo Coaster From China Factory, Low price Photo Coaster, Top Quality, True wholesale source for original!